We Akil Corporation based in India, are stockiest and exporter of Marine Engine, Diesel Generator, Marine and industrial Machinery and its respective spares. We have available Mak 9M20 Charge Air Cooler from Engine Built-2001 with very good condition. We are dealing with Charge Air Coolers. We are one of the trustworthy organizations in the market that is involved in offering a wide range of Charge Air Cooler to our customers. This Charge Air Cooler is manufactured in accordance with set market quality standards and norms. Besides, these products are available at most economical prices. Application: Car, Trucks, DG Sets, Compressor, Windmills, etc. - Extruded, knitted rubber and silicone hoses. - Wrapped silicone hoses (calandered). - Complete CAC Inlet & Outlet assemblies. 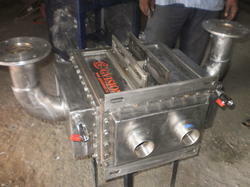 At Fluid Dynamics Pvt Ltd., (FD) we offer variety of customised charge-air- coolers in Brazed Aluminum Construction. Structurally, the core matrix can be made from Fin & Tube combination or Bar & Plate combination. 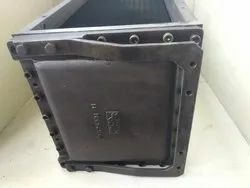 Tanks could be made from Cast Aluminum or Engineering Plastic suitable for high temperature operations. We manufacture charge air coolers with cooper tube and aluminum fins, which enhance for better cooling, and cost effective, for gen-set application & industrial application. We manufacture only for OEM supplies and to their requirements of quality, in time delivery & cost. Due to our enormous understanding and massive knowledge of this business, we are involved in offering Charge Air Cooler.